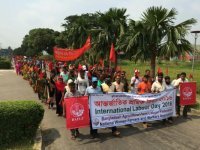 May 1, 2016: The historic May Day also known as International Labour Day is being observed today by Bangladesh Agricultural Farm Labour Federation (BAFLF) & National Farmers and Workers Association (NWFA). BAFLF have arranged various programmes including colorful processions, rally, discussion meeting. 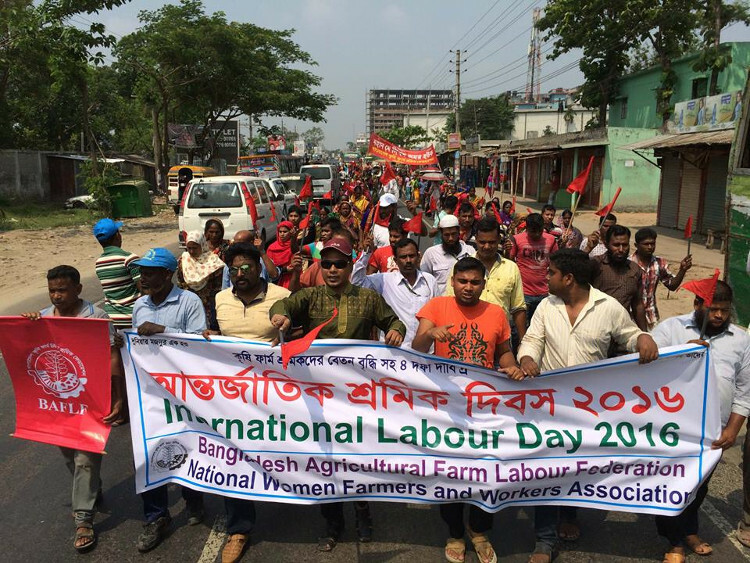 More than 2000 Agricultural farm workers from BAFLF’s affiliates trade unions and associations including NWFA, BARRI workers union, BRRI shramik somity, NATA shramik somity took part in a rally brought out from BARRI headquarters returning back from in front of Gazipur District Commissioner office and ended at BRRI headquarters. After the procession and rally a short discussion was held. Md Mamun of BAFLF moderated the discussions. Among others Rima Akter, Norjahan Begum of NWFA, Abdul Mazid, Lahaj Uddin Lahun, Abdul Hamid, Golam Sorowor and Md Rahimuddin of BAFLF delivered their speeches at the occasion. The speakers of the gathering mentioned that workers have been continuously deprived. They don’t have job security and better wage. Workers’ working condition is not also safe and healthy. Thousands of agricultural workers in rural area are unemployed, they did not get work. So they left villages and migrated into cities with their families where they lead very miserable and insecure life. The speakers demanded that Govt. should concentrate on agricultural workers and take measures for their food and job security. 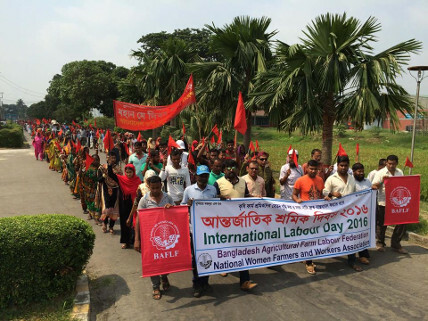 Abdul Mazid, General Secretary of BAFLF said that, Agricultural Farm Workers are fighting for permanent employment, improved retirement benefit, paid weekly holidays and maternity leave. He expressed his hope that we must achieve our just demands as we are united. He added The International Labour Day enhances our courage to carry on our struggle for our rights, lives and livelihood. He demanded for improving the working conditions with better wages for workers and job security. Rima Akter, general secretary of NWFA, said women workers engaged in agriculture are not getting fair wage though they work more than male counterparts. They are deprived of equal facilities, just wage. She urged the Govt. to give sufficient allocation for agriculture in upcoming budget and increase subsidy in agriculture for sustainable agriculture as well as to save farmers and agricultural workers.